Last year, I wrote about “Going from HRTech to WorkTech”. It was my attempt at defining this emerging theme (“WorkTech”) and prognosticating the future. 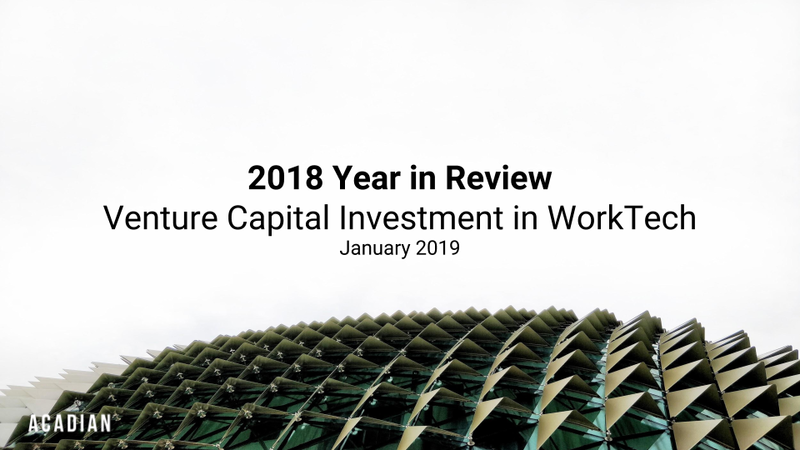 Modeled after Mary Meeker’s annual Internet Trends Report, my goal was to share historical data and insights defining the past, present and future of work and combine it with understanding where venture capital (VC) investment was flowing. As someone who has been a student of the “HRTech” space for nearly 20 years, I believe that we are at a new inflection in the market. The global skills divide is widening and our expectations of work is changing rapidly. Most of the technology that has defined “HR Tech” over the past two decades has been built solely for automating processes and managing compliance, designed in a hierarchical model with static jobs, based upon a workforce of full-time employees. Work isn’t changing — it HAS changed. The freelance economy is booming and the “side hustle” has become pervasive among all generations in the workforce. This change has also be indicative in venture capital investment with companies focused is modernizing work. 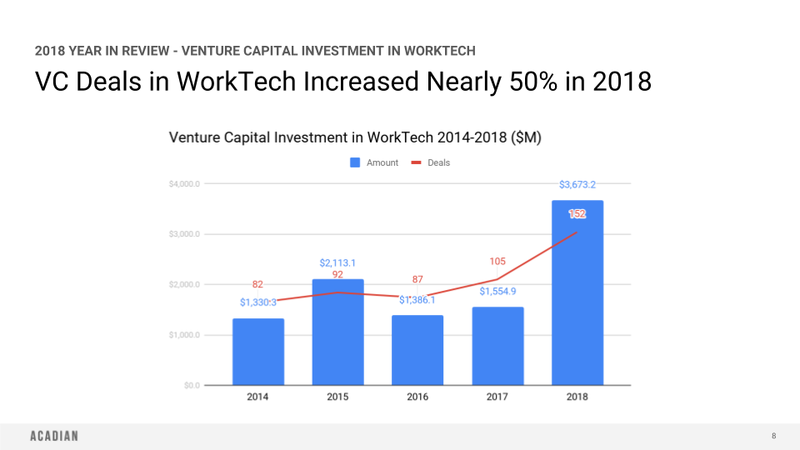 If the last two years of VC investment in WorkTech is any indication, the next 10 years that define how we work will be completely different than the last 50 years. On a dollar basis, venture capital investment was up 136% year-over-year and surpassed the combined investment from both 2016 and 2017. On a deal basis, the number of investment surpassed 150 “deals”, increasing 45% from 2017. A number of factors contributed to the mass inflows of investment in WorkTech including the expansion of venture capital itself (with new funds and new investors entering VC investing), the continued migration to “the cloud”, and the demand for new technologies to manage the multi-faceted complexities of work today (freelance-centric, team-based, office-less, etc.) that incumbent vendors are unable to support. While we don’t expect similar triple-digit growth of venture investment in 2019, we anticipate continued strong activity and investor interest in the market. 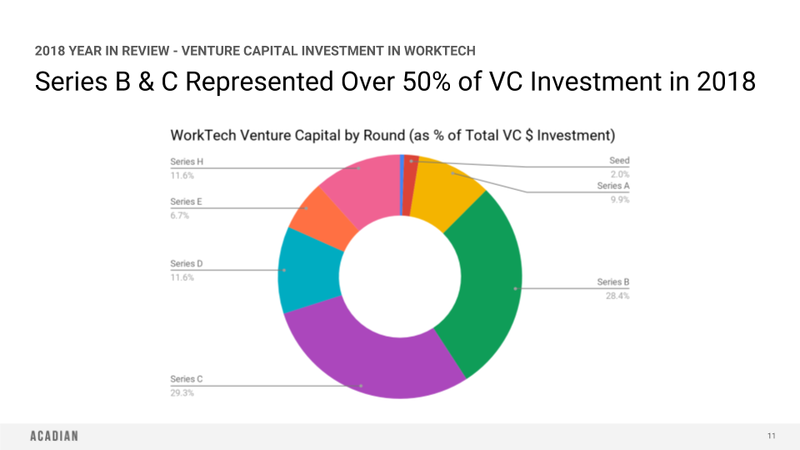 Over 400 unique venture firms participated in a WorkTech investment in 2018. While no one venture firm in predominate in the market, we see a lot of diversity of investors including Tier 1 venture firms, boutique micro-venture funds, universities, state investment funds, angel networks, corporate venture funds, and financial “sponsors” such as private equity firms. In 2018, a majority of venture capital investment occurred in the Series B and C rounds. Interestingly, check sizes varied widely in Series B and C investments. Series B “ checks” ranged as low as $5M (Teamable) all the way to $156M (ZipRecruiter). Similarly, Series C “checks ranged from $7M (meQuilibrium) to $140M (Gusto) suggesting the path to raising capital can vary widely. Unlike just a few years ago, venture capital investors can now be found throughout the world. This is great news for entrepreneurs, especially in emerging countries. 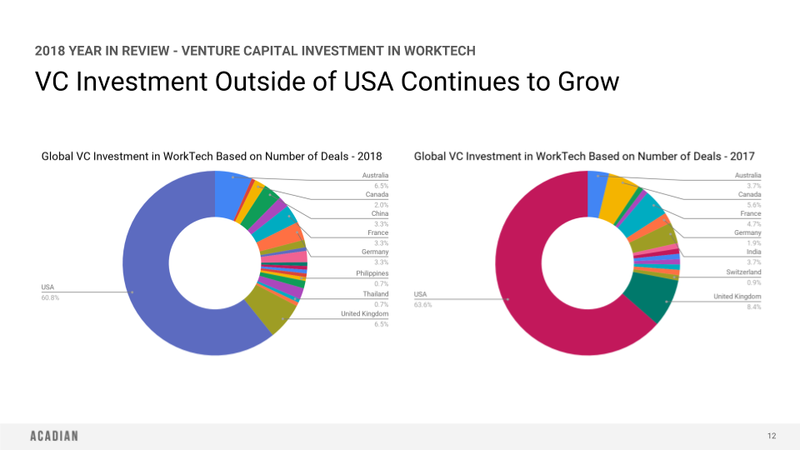 In 2018, WorkTech-focused venture investments outside of the US came from over 20 countries with UK, Australia, France, and Germany taking the top 4 spots (in terms of the number of deals). We expect this trend to continue over the next few years. Technology skills are no longer limited to a few countries and great tech talent can now be found around the world. That levels the playing field for starting new companies. In addition, many government around the world are creating economic incentive for startups. Paris and Berlin, in particular, have thriving ecosystems of WorkTech startups. Lastly, valuations can be more attractive and less competitive in newer geographies thus attracting new and existing VC firms. The full report and database can be found at Acadian Advisory (subscription required). You can also subscribe to our Acadian First Take Monday newsletter for weekly industry news, insights, and trends.